Q: Sheryl, could you tell us who are the primary users of Infinio Accelerator? A: A broad range of organizations use Infinio, from large corporations like Marriott Vacations and Mitsubishi Business Services, to universities like University of Georgia and Auburn University, to healthcare companies like Sentara Healthcare and Fresinius Kabi, and many others in different verticals. The solution is really applicable across industries and use cases. Q: What are some of the key challenges you are helping them solve? A: We enable people to do things like run reports faster, compile software more often, and improve users’ experience in applications. Plus we do it all with a much lower CapEx investment than alternatives. The alternative to Infinio is to purchase expensive hardware and manage large migration projects to new platforms. With our software, they can begin delivering high performance within 15 minutes without any disruption to their operations. Q: Can you tell us more about how Infinio works? A: We deploy a small piece of software – an I/O filter – across all the hosts in a VMware cluster. This filter is part of VMware’s APIs for I/O filtering (VAIO), and enables us to intercept I/O requests very early in the I/O path. We cache a copy of the hottest data on server-side resources (like RAM and flash devices) where they can be retrieved as quickly as in 80 microseconds (0.08ms). 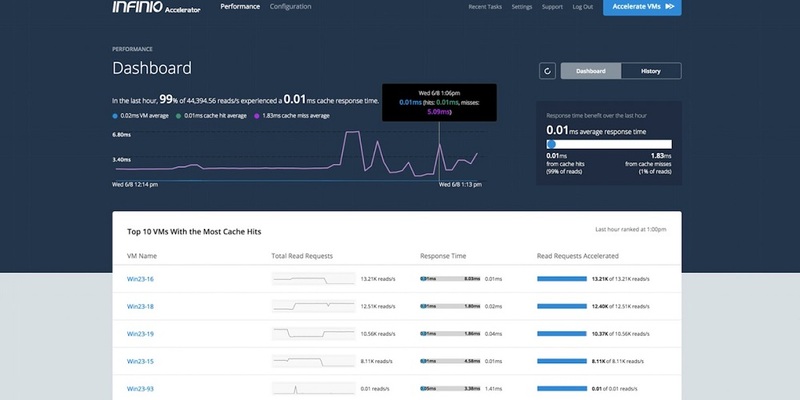 And we use realtime inline deduplication to use all these resources as efficiently as possible – some customers with smaller working sets run exclusively on RAM. A: Many of your readers are probably familiar with Intel’s next-generation SSDs based on their Optane technology. We’re collaborating closely with Intel on testing Optane with Infinio, and the early results have been very exciting. VMware users can have higher performance I/O at a lower price point than ever before. Q: Tell us something surprising about your solution. A: Even customers with the highest-performance platforms available – all-flash arrays – have seen great results when they include Infinio in their infrastructure. You can’t beat local RAM, even when storage is deployed locally. Numerous customers have deployed Infinio with all-flash arrays and see reports complete faster, users adopt new applications more easily, and storage CapEx go down.